With the Commercial and Home Wine Competitions now just fading memories, the 2018 OC Fair is fast approaching, and the OCWS is geared up to run our most important fundraising effort of the year—The Courtyard at the OC Fair. 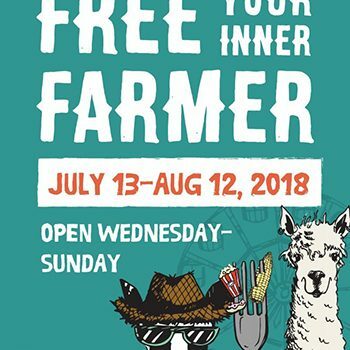 This year’s Fair theme is “Free Your Inner Farmer,” and the Fair runs Wednesdays through Sundays, beginning on Friday, July 13 and concluding on Sunday, August 12. The Fair was attended by over 1,400,000 people last year, so The Courtyard clearly provides us with a perfect venue for reaching lots of people with our mission of wine education. In exchange for running the OC Fair’s wine competitions, the Orange County Fair and Events Center affords us the opportunity to run The Courtyard and realize the income therefrom. In addition to the income received from The Courtyard funding the wine competitions, it also provides funds for our year round overhead and, by way of donations, for our Scholarship Program. So, it is of utmost importance to the organization that The Courtyard be a huge success! It takes over 300 OCWS volunteers to man The Courtyard during the Fair. Whether you are a new volunteer or a seasoned veteran at The Courtyard, this is your opportunity to support the fundraising efforts of the Orange County Wine Society. In addition to hosting The Courtyard during the OC Fair, some of the most knowledgeable and experienced OCWS members will be conducting wine seminars on Saturdays and Sundays. Check out the seminar schedule on the OCWS website and come learn something new about wines and wine pairings that you may not know you don’t already know. So, if you seek fun, don’t miss coming out and freeing your inner farmer with wine fun at the Fair! I look forward to seeing you there. The support of the Judges at the 2018 Commercial Wine Competition knows no bounds. In addition to the Judges, with the exception of a small stipend, paying their own way to attend and judge, each year a handful donate back their stipends to create a Judge’s Scholarship, which is then granted in their honor by the OCWS. This year, we extend our heartfelt appreciation to those Judges who, collectively, donated $2,000 toward our mission of scholarship fundraising for grants in enology, viticulture and culinary arts. Special thanks to the following judges for their kindness and generosity: Brent Amos from Las Positas Vineyards; Joseph S. Franzia from Forest Glen Winery; Ondine Chattan from Cannonball Wines; Jessica Gasca from Story of Soil; Alfredo Koch from Allen Hancock Community College; Steve Lohr from J. Lohr Winery; Stephen Rasmussen from Westgate Cellars; H. Marty Spate from Meridian; Fred Weibel, Jr. from Weibel Family Vineyards & Winery; and Evelyn White. We urge all our OCWS members to support their businesses, and if your paths cross with these generous people in your travels, to please thank them personally and relay to them just how much their caring ways mean to all of us. Thank you. The Wine Society would like to take this opportunity to acknowledge Graber Olive House for their friendship, generosity and continued support over the years. Graber Olive House has provided their specialty olives to the Commercial Wine Competition for many years. As you know, palate assault can be extreme even though wine judges may expectorate every sip. The acidity in white wines and tannins in red wines can be a painful experience after a full day of tasting. A small cup of Graber olives placed alongside each judge neutralizes the elements in both reds and whites, work wonders for the palate and taste fantastic, too. Graber Olive House is located in quiet, serene surroundings. Visitors will be delighted to discover a bit of early California when they visit. Along with olives, Graber Olive House offers many other products, such as crisp California almonds and pistachios, California dessert fruits, olive oils and elegant gift baskets. When in or driving through Ontario, visit Graber Olive House and pick up a few cans of olives and other items. You can also visit their website at GraberOlives.com to have products shipped directly to you.